Orlando, Florida, November 11, 2018 – Laser Photonic’s Corporation combats mobility, motion range, and cleaning precision issues in Galvo-Scanhead Systems by using Flexion Technology in it’s cleaning systems. Galvo-Scanhead System Issues: Mobility, motion ranges, cleaning precision. Flexion Technology was developed by Laser Photonics as an approach and solution to the hard-to-clean surfaces static mounted Galvo-Scanhead systems have. Flexion technology provides a distinct advantage over other laser cleaning systems on the market. 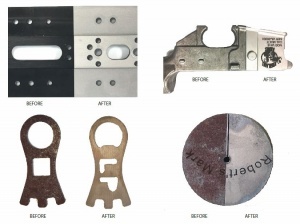 Flexion technology allows a CleanTech system to easily remove rust, paint, anodization, and other surface materials in areas that are typically difficult to reach or have complicated shapes, especially during surface preparation. Most other systems are statically positioned which limits the laser cleaning ability to only the static path of the trajectory beam. The CleanTech Megacenter with Flexion technology offers a motion control stage that operates in both x and y axis, allowing the ability to move in various directions and clean nested parts under the path of the trajectory beam path. 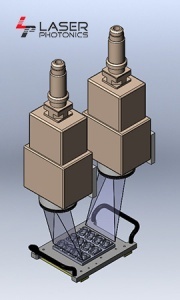 This unique technology allows the laser cleaning process to efficiently affect 100% of all sides of the exposed parts. The Megacenter is available as a standalone or can easily be integrated into a production line. The figure illustrates how Flexion Technology cleans 100% of all sides of exposed parts. Flexion Technology offers 3D capabilities along with 6 axis mobility that the stationary mounted galvo-scanhead systems do not. Flexion Technology increases the full range of motion for Cleantech products to apply its laser surface cleaning to reach areas that the stationary mounted Galvo-Scanhead systems cannot achieve. Flexion Technology coupled along with Infinite Field of View (IFOV) will achieve the most effective and efficient way to prepare surfaces and clean rusted, painted, coated and oxidized surfaces known to man.